Americano – it’s like an espresso for those who don’t like short, hard-hitting coffee. The creation of this beverage allegedly happened during WW2, when the American soldiers who were stationed in Italy found the Italian coffee to be a bit too strong. Nowadays, with all the modern gear available (did you discover single-serve brewers yet? 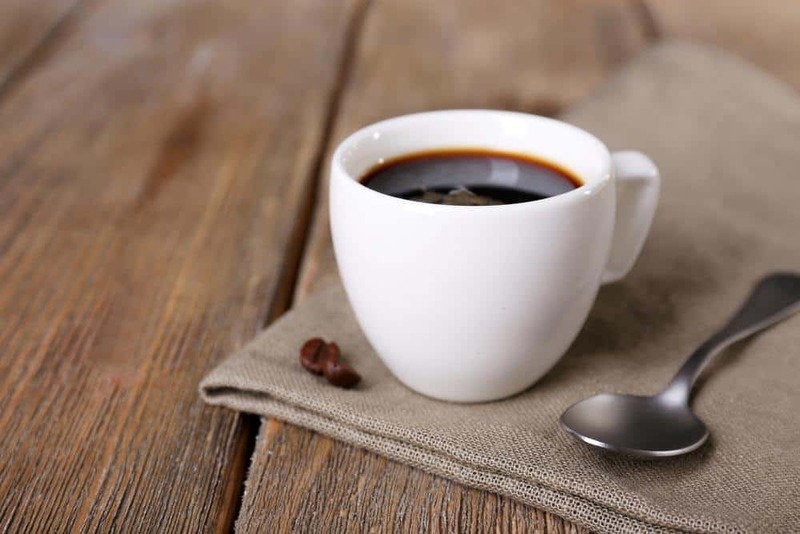 ), preparing coffee, including Americano has never been easier.The following article contains instructions on how to prepare this drink as well other useful information about it. Sounds good? Read on! To put it simply, Americano is a shot of espresso with some added hot water. We already mentioned the history of the drink, and since its creation, the recipe has remained unchanged. Still, the fact is that there are better and worse ways to prepare this beverage, and in the following sections we will go over some crucial points that you need to know to brew a proper cup. For a good Americano you will first need good espresso. Ideally, this means that you find some top quality beans and a fine espresso maker, but this isn’t necessary. You can use a pod coffee machine too if you prefer. However, a very important factor that determines the quality of an Americano is the flavor of beans. When you pour in hot water over the espresso, it will emphasize the coffee’s bitterness, and this means that you should try to find beans which are not very bitter. If you fail to do to this, the result will be less than optimal, and your beverage is not going to be as enjoyable. As you probably know, it is really important how much water you put in. This will largely determine whether the outcome is a success or not. Too much water will make the Americano too bland it will resemble drip coffee. Too little water will make it too strong. So what is the magic number? Believe it or not, this has turned into a science and baristas have calculated the perfect amount of water for the given amount of espresso (single shot, double, or triple). You can see that the amount of beverage is given in grams, and we’re going to clarify this further. Let’s explain by using an example. Say that you use 14 grams of coffee grounds to make a single espresso shot. The next thing that you should do is place that cup on a scale and tare to zero. Then, grab some hot water and pour into the cup until you reach the desired grammage (197 grams, in this case). Voila! Your cup is ready! Now, if you don’t want to memorize the numbers given above, just measure the weight of the coffee grounds that you plan to use and multiply it by 14 to get the final weight. 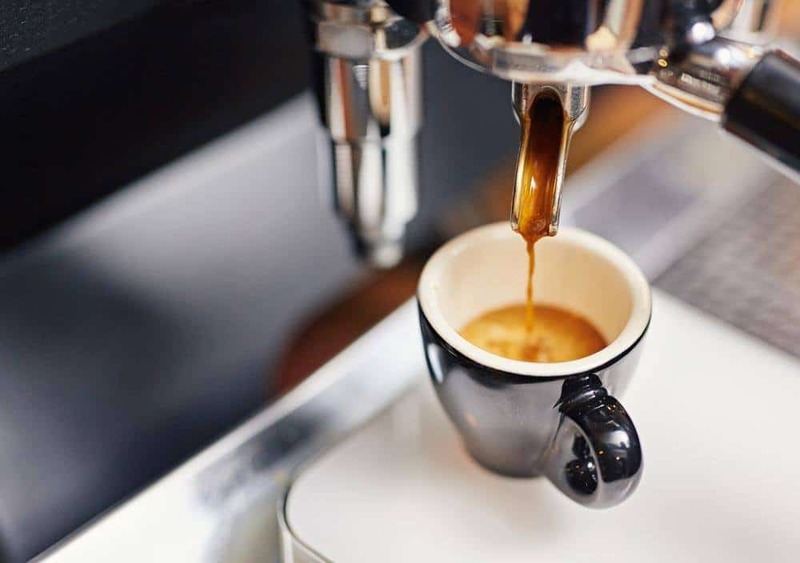 If you’re not into measuring and precision, you can also do it the layman’s way – just pour in 1 to 8 ounces of hot water over espresso. You’ll need to experiment a bit until you find the amount that suits you. 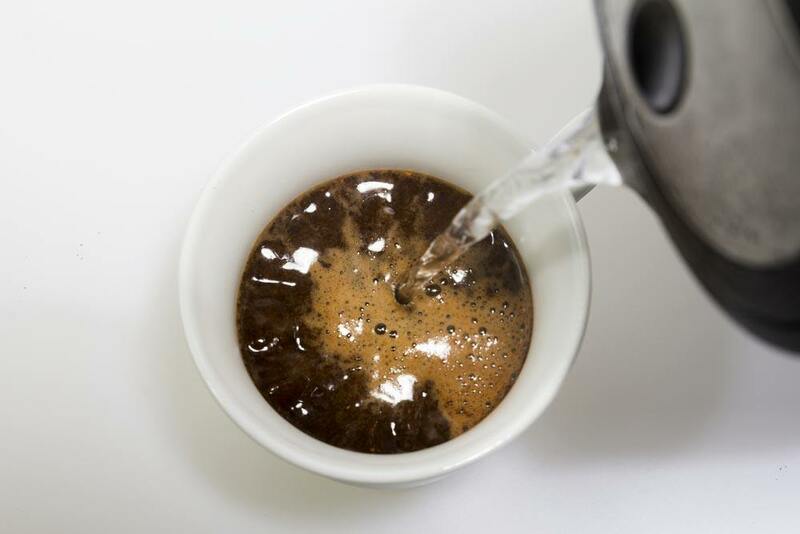 In most cafés, Americano is prepared by pouring hot water over the espresso. This is fine, and it will make a perfectly good cup of Joe. However, if you are in the mood to try something a bit different do it the other way around – first water, then espresso. Why should you do this? Well, pouring the espresso over the hot water will help to maintain the beautiful crema that forms on top. This is one of the most important features of a proper cup of coffee (according to some folks), and if it’s important to you too, then try this method. If you wish to be really precise with the preparation of your beverage, then you can get a thermometer and measure the temperature of the water. The right warmth according to most sources is anywhere between 185°F and 200°F. Our best advice is that you try different temperatures and see which one yields the most delicious result. Due to modern world’s obsession with coffee and all things related to it, the preparation of this once simple beverage has been transformed into an art, and in some cases, even science. It’s very easy to be a coffee geek nowadays, and we see no harm in it, but if you are a simple, give-me-my-cup kind of person we assume that you won’t care about the finesses too much. 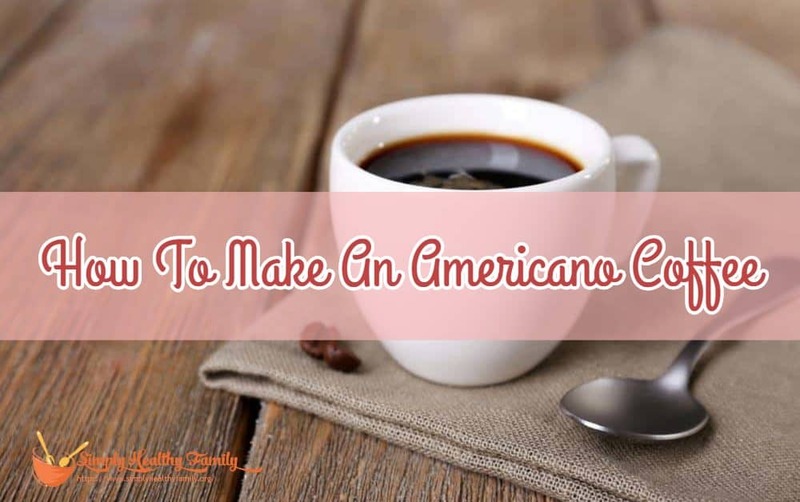 Whichever category you fall into, we hope that you will find our article useful and that you’ll be able to enjoy Americanos for years to come.